Fethiye Pamukkale Tour is a visit to the heaven on earth. Imagine multi-leveled mini pools, in a combination of azur blue and cotton white. 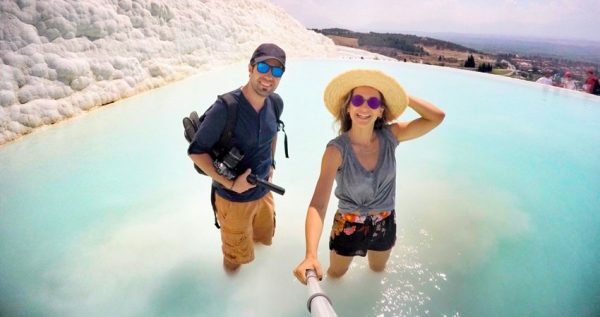 Pamukkale is one of a kind travel destination in all over the world, so you will return your home with a memory that you can share with your loved ones. Within this excursion you also visit one of the greatest ancient cities of Roman Empire – Hierapolis, Swim in a refreshing antique pool which once belonged to Egyptian Queen, Cleopatra and get informed by our experienced guides. Pamukkale is a gift from mother earth and it’s amazing view makes you to forget everything stressful and to get relaxed. You can take your shoes off, get in those shallow small pools and enjoy the sensation. Moreover, you can also swim in mineral-rich water created milk-white travertines. As soon as you get in, you will forget how much you are tired. When you look at Pamukkale from a distance, you will see an amazing and miraculous snow white castle which looks like came straight out of heaven. Do not forget your cameras, as you will regret if you miss the chance of taking photos of Pamukkale. You will have the chance of visiting Hierapolis which means “blessed city” in Ancient Greek Language. 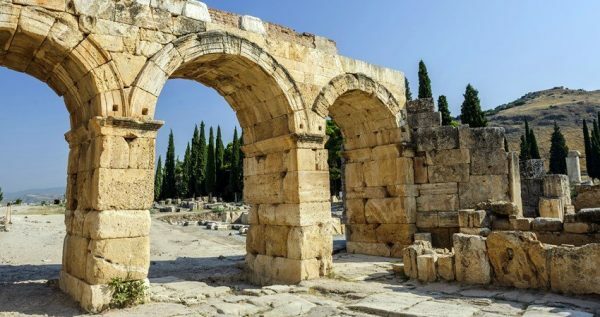 While you are enjoying the view of the remains of the city, our polite and experienced tour guides will be informing you about the structures. 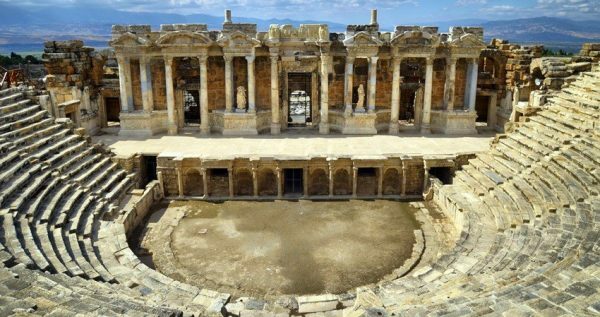 Greco-Roman theater, Roman Bath, Plutonium, Basilica of St. Philip, City Agora and Temples and Fountains are just some of the remainings from Hierapolis Ancient City. This trip will be a unique chance for you to experience the combination of history and relaxation. Cleopatra’s pool is a very precious symbol of history. 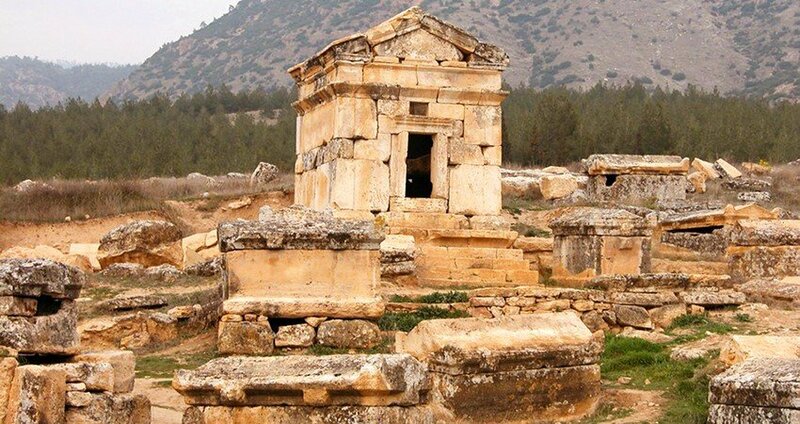 Imagine being in a place that once a legendary Queen wandered around and enjoyed. If you choose to swim in this pool, it will embrace you with its skin-renewing qualities. 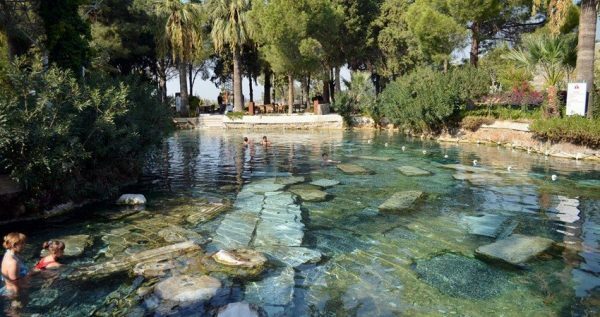 It is naturally filled with mineral-rich reviving water, you will feel the relaxation in your skin while having a rest in the 35-36 degrees warm pool. 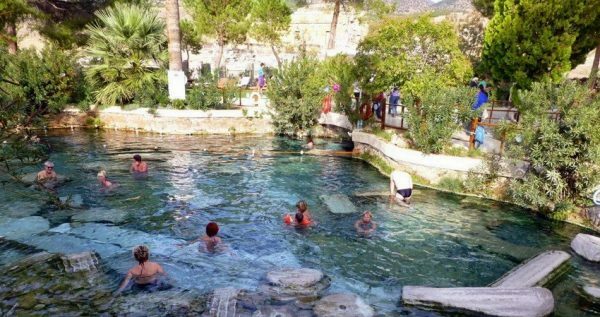 Pamukkale’s warm water has special properties which cure ailment, rickets, cardiovascular, neurological, skin and gastrointestinal sicknesses, lumbago, psoriasis and dermatitis. Fethiye Pamukkale tour gives you unique chance of walking on cotton-like white natural pools filled with mineral-rich water, swimming in a pool which is 2.000 years old, visiting Hierapolis Ancient City and learn a lot about history and culture. You will leave our excursion with a lifetime memory that you will always remember with a smile on your face. 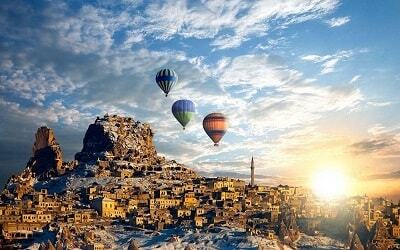 Pamukkale tour is something that shouldn’t be missed if you visit Turkey. Another famous natural beauty near to Fethiye is Dalyan – Turtle Beach. 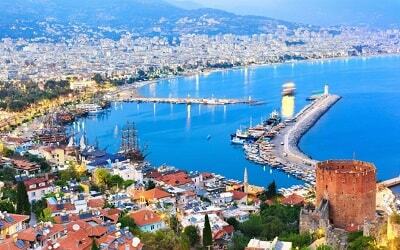 Our kind drivers will be ready in front of your hotels at Fethiye and close by regions between 06:00 / 06:30 to pick you up. At the begining of the day, we will serve you a delicious traditional breakfast. After a good breakfast, you will be ready to explore and discover what miraculous mother nature hides for you. As we think everything to make sure you feel comfortable and relaxed, we will provide you with a comfort break before visiting Pamukkale. You can use the restrooms and you can shop for snacks and souvenirs to keep as memories from this amazing experience. Our guides will inform you more about this during the excursion. This is the most amazing part of Fethiye Pamukkale Tour is to visit cotton castle itself. Our knowledgeable and well-educated guides will show you this miraculous natural beauty while giving you a detailed information about the travertine formations. Within your free time you will have the chance to swim and relax in them. We suggest you to catch this opportunity to visit this astonishing natural beauty. 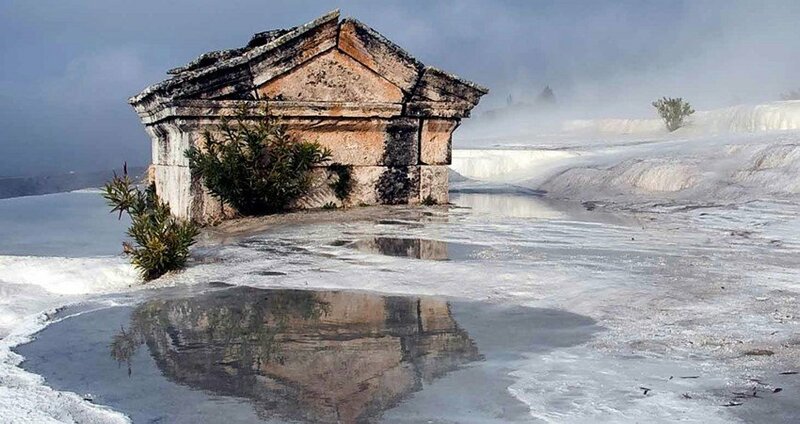 Hierapolis Ancient City dates back to two thousand B.C. 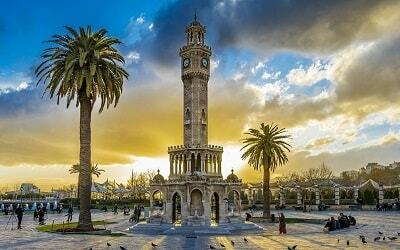 Within your free time you can visit structures of this astonishing city. 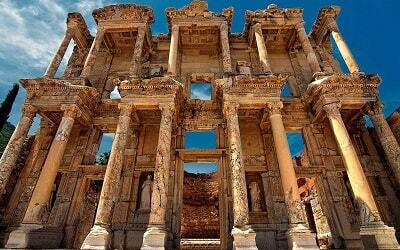 You will forget how the time passes while you think about the way of life in those times after our polite guides inform you about the ancient remains and culture. We will return you to your hotels after a comfortable trip. Our experienced drivers will make sure that you will take a nice ride.